It is not generally known that Stevenson was both an amateur musician and composer. He played piano, pennywhistle and the Boehm flageolet, a kind of keyed soprano recorder, and wrote or arranged music for these and other instruments. He also wrote melodies to his own poems or set his own lyrics to classical or familiar melodies, the best known probably being ‘Sing Me a Song of a Lad That is Gone’, set to the tune of The Skye Boat Song and used as the theme to the television drama Outlander. John F.M. Russell has compiled a chronological list of Stevenson’s music manuscripts, providing it with facsimiles and links to sound files, transcriptions, quotations and additional commentary. 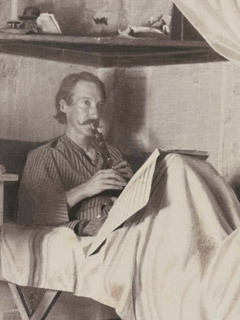 The list can be found here: Music of Robert Louis Stevenson. A catalogue of musical settings of RLS poems and musical works inspired by his writings can also be found in the Richard Dury Archive. We warmly invite you to use these resources to explore an often overlooked aspect of Stevenson’s creativity and talent.